Lacrosse is one of the fastest growing sports in the U.S., with participation increasing at an estimated rate of over 10% per year. New rules for 2008 High School Boys Lacrosse include rules on the size of goalie stick and uniforms. Why is lacrosse becoming such a popular sport? 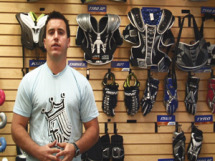 Neal Goldman, brand manager for men's lacrosse at Brine, offers some possible reasons.